Includes pink silicone heart-shaped teething ring Artist: Ping Lau Size: 20" Head to Toe Material: GentleTouch Vinyl Weighted Cloth Body for a "Real Baby' Feel Beautiful handset eyes Eyes - Blue Hair: Auburn/Light Brown Vinyl Length: 3/4 Vinyl Arms, Legs Intended for ages 14+ This Sweet Swan ballerina will dance her way into your heart. With a gleeful grin that reveals two precious baby teeth, and her big blue smiling eyes, this lifelike doll is ready for her close up. She wears an adorable dress with a soft white tulle skirt and white satin under skirt. A satin swan applique with metallic embroidered touches accents her heather gray jersey knit bodice. Her leggings and hair bows sparkle with gold heart imprints. And her look is completed with gold sparkle Mary Jane shoes. One dance and you're sure to want an encore! Sweet Swan is masterfully sculpted with true to life detail by world renowned artist and doll sculptor Ping Lau. Her lifelike features are handcrafted in GentleTouch vinyl and a weighted soft cloth body makes her feel amazingly real. She comes with a pink silicone heart-shaped teething ring, a numbered Certificate of Authenticity, and an exquisite collector's box. 20" from head to toe Artist: Karen Scott Constructed from GentleTouch vinyl African-American skin tone Curly dark brown hair Brown eyes Hand painted lips, fingernails and toes ¾ limbs Comes with onesie, bib, pants, white socks, magic juice bottle and hammer plush toy Doll Weight: 2.60 pounds Shipping Weight: 4.42 pounds Intended for Reborn Doll Collectors age 14+ Wonderfully Made was built with love just for you! 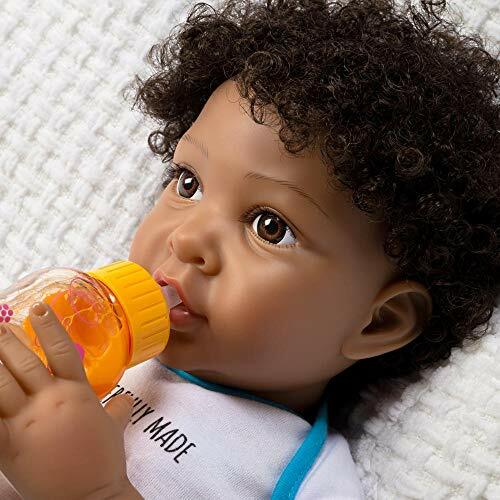 His big, brown eyes and perfectly ringed curls make this African American baby boy doll an adorable addition to your nursery. It's hammer time! Wonderfully Made is dressed in a cuddly soft onesie screen printed with Wonderfully Made and a measuring tape the reads MY MOM RULES. His bib and pants have a playful blue print that resembles everyone's tool box. He'll be by your side through any project and is always willing to lend a helping hand with his plush hammer. He is splendidly sculpted by awarded doll artist Karen Scott. Wonderfully Made is constructed in GentleTouch Vinyl with lifelike features and a weighted cloth body. He comes with accessories shown, a numbered Certificate of Authenticity and a collector's box. 20" from head to toe Artist: Sherri Williams GentleTouch Vinyl Caucasian skin tone Blue eyes Light blond hair 3/4 Vinyl limbs Comes with pink dress with flower appliqués, matching headband, glittery crown, white pacifier, satin shoes and white socks with lace detail Intended for Reborn Doll Collector's age 14+ Crown Princess will reign supreme! 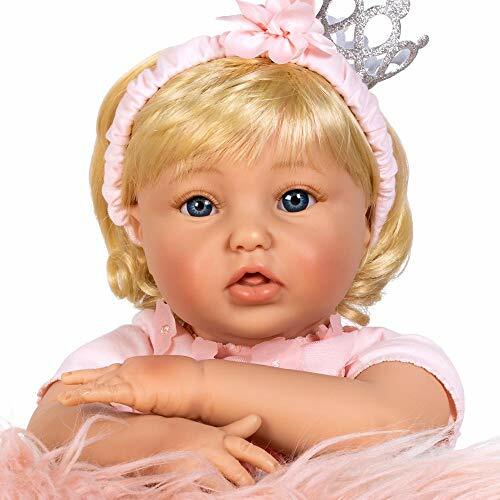 This royally cute reborn baby doll will melt your heart the minute you lay your eyes on her. We gave her the royal treatment; no detail was overlooked while creating her! From her glittery crown to her flower appliqué dress, this doll is fit for a princess. She also comes dressed in a headband and satin shoes, both with flower appliqués and white socks adorned with a lace trim. Bring Crown Princess home and she'll be the crown jewel in your nursery. Crown Princess is expertly crafted with incredible lifelike detail by artist Sherri Williams. Her head, arms, and legs are handcrafted from Paradise Galleries' GentleTouch vinyl, with a huggable weighted cloth body. 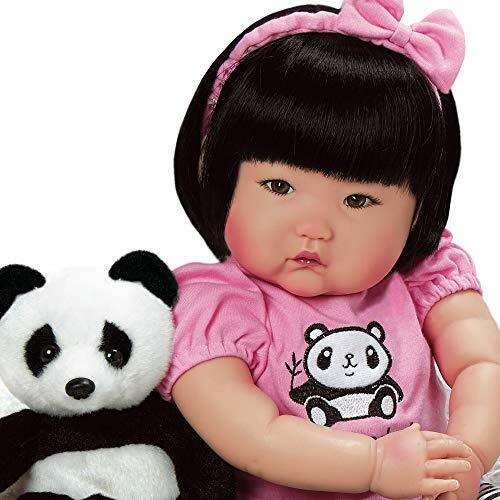 This realistic reborn baby doll arrives inside a Collector's Box and includes a numbered certificate of authenticity with the artist's signature. Size: 12\"8 x 14.5 x 12"
THRIFTED LEE MIDDLETON/REVA SCHICK 1997 DOLL GOT A MAKEOVER! 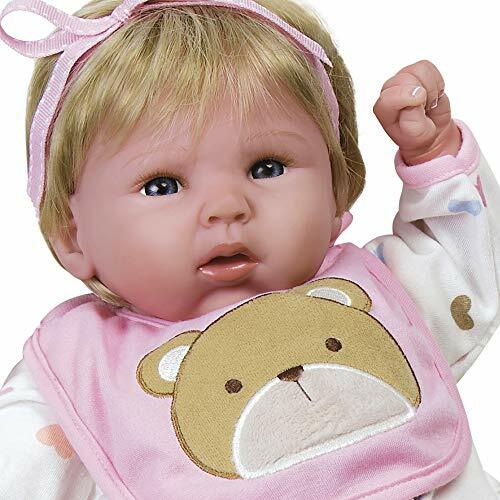 Want more Lee Middleton Toddler Doll similar ideas? Try to explore these searches: Fur Footwear, Hunter Green 15 Ring, and Silver Tone Communion Tray.